Aligns feathered blades with water flow, not shaft. 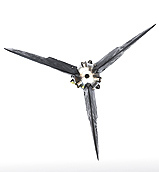 Patented Feature: Blades free to trail like weather vanes. Feathered propeller does not auto-rotate. Eliminates shaft locks. Robust, low stress design without highly stressed gears. 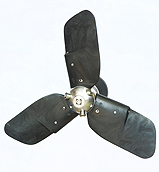 Fail safe design features built around composite blades and nose cone which minimise corrosion and lubrication problems. Hi-tech Zytel™ blades give strength and light weight with low inertia and no shock loading. Easy to replace and lubricate but well locked in against blade loss. Near neutral buoyancy means blades are responsive to the smallest changes in water flow thus always minimising dragwhen sailing. Eliminating the gearing allows the economical production of 3-blade units which are more efficient and smoother running. Easy pitch adjustment with self-locking set screws in each blade allows optimal performance adjustment and eliminates inventory. Common boss accommodates all standard shafts and saildrives.